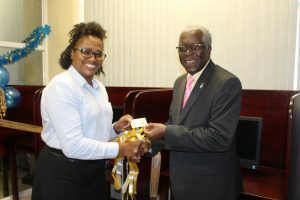 The Guyana Civil Aviation Authority (GCAA) on Friday commissioned its modern licensing and examination system for pilots, aircraft maintenance engineers (AME) and Air Traffic Controllers (ATC), the regulatory agency said in a statement. The new licensing system will see the introduction of a plastic card license being issued to applicants who are successful at their examinations administered by the Personnel Licensing (PEL) Unit, replacing the old paper booklet license being issued to pilots, AME’s and ATC Officers. At the simple ceremony held at the GCAA’s Boardroom on July 21, 2017, Junior Minister of Public Infrastructure, Miss. Annette Ferguson, applauded the staff of the GCAA for the initiative of modernising the Authority’s operations, in keeping with the Government’s green economy agenda. The Minister noted that Guyana is becoming compliant with the International Civil Aviation Organisation (ICAO) standards, and is now on par with the other countries that already have an automated licensing and examination system. The Minister admitted that while she does not possess a technical background, she is passionate about the operations within the aviation sector and pledged the governments full support for the development of the sector. Director General of the GCAA, Lieutenant Colonel (Ret’d), Egbert Field in his address said that the system was procured from Central America Corporation for Air Navigation Services (COCESNA). He pointed out that the system was built to run on the Windows platform with licensing modules for the creation and management of records of the licence holder. The system is designed to prepare unique examination for each candidate and provide the scores obtained within ten minutes, while restricting the applicant’s ability to cheat during the examination. “We’ve got to stay in front of the race, and one of the things we have included is to install cameras so that individuals can be monitored while taking their examination, and not google some of the answers” Mr. Field said. Chairman of the Board of Directors of the GCAA, Lieutenant Colonel (retired) Lawrence London, said the monies invested in training staff and procuring equipment is beginning to pay off, particularly with the production of oil and gas on the horizon. “This event is a step in the right direction, it tells me and the authority that we are moving swiftly in the right direction, we are preparing for the challenges ahead of us”. Mr. London encouraged the staff to guard against persons who may want to manipulate the system with dishonest motives in mind. There are currently 110 registered pilots, 155 aircraft registered AME engineers and 28 ATC Officers, all of whom would now have to use the COCESNA Licensing and Examination System to either renew or upgrade their licenses. Additionally, examinations for new applicants will be administered on the automated system at the GCAA’s Personnel Licensing (PEL) Unit.